Mild tasting sunflower oil often takes a back seat to other cooking oils, but people should give it a second look. Not only does it offer cooking benefits, but there are many health benefits of sunflower oil as well. Sunflower oil is made from sunflower seeds. According to the National Sunflower Association, there are four types of sunflower oil. The oils contain a variation of three types of fatty acids - stearic, oleic or linoleic. Stearic acid is a naturally occurring saturated fatty acid. Oleic acid is a monounsaturated omega 9 fat. Linoleic acid is a polyunsaturated omega 6 fat. Mid Oleic: This is the most common type of sunflower oil in North America. It has a long shelf life and holds up under high heat making it great for frying. It contains 65% oleic acid, 26% linoleic acid and 9% combined saturates. High Stearic/High Oleic: This is the newest sunflower oil. It was created as an alternative to hydrogenated oils with a higher saturated fat content. It can be used for recipes that require a solid oil, such as baking. The oil contains 72% oleic acid, 5% linoleic acid and 5% other saturates. High Oleic: This oil is extremely stable and its oleic oil content starts at 82%. Some hybrid versions have oleic content as high as 90%. High Linoleic: This oil contains 68% linoleic acid, 21% oleic acid and 11% combined saturates. The oil is low in saturated fat but prone to oxidation during frying. Thanks to its main ingredient - nutrient-packed sunflower seeds - sunflower oil offers significant health benefits. NuSun sunflower oil is the newest sunflower oil on the block and it's creating quite a buzz. A Penn State University study determined that a diet that includes NuSun sunflower oil "significantly reduced total and LDL cholesterol levels compared with the average American diet." Surprisingly, olive oil did not show the same benefit. Vitamin E may also help improve manage blood sugar in people struggling to maintain glucose control, according to Doctors Health Press. However, more study is needed to prove this theory. The linoleic acid in sunflower oil is an omega 6 fatty acid. Omega 6 fatty acids are unsaturated fats and considered essential fatty acids. This means the body cannot make them on its own but must be obtained from foods. The American Heart Association believes that omega 6 fatty acids are heart healthy and should make up five to ten percent of people's daily calorie intake. When it comes to omega 6 fatty acids, you can have too much. In fact, it's very important to have the proper balance of omega 6 and omega 3 fatty acids in your diet. While omega 6 fatty acids can help prevent disease when properly balanced with omega 3s, a diet too high in omega 6 fatty acids can cause inflammation which may lead to serious illness such as asthma, heart disease or cancer. For optimum health, UMM recommends a ratio between 2:1 - 4:1, omega 6 to omega 3. Sunflower oil's emollient and moisturizing properties have made it a favorite natural skin care remedy for many people. It's sometimes used as a natural moisturizer or to relieve minor skin irritation. The oil can also be found in some anti-aging products and lip balms. Sunflower oil combines nicely with essential oils and makes a great carrier oil for natural skin care preparations or for massage. 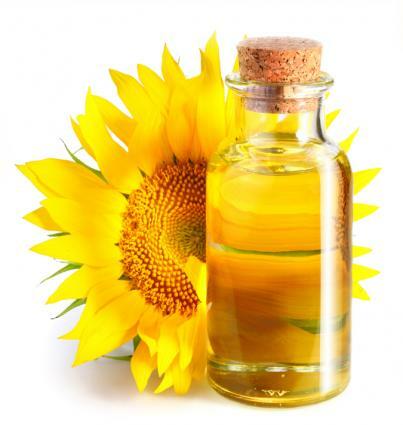 Studies seem to back up the skin benefits of sunflower oil. According to a PubMed abstract, when sunflower oil was applied to adult skin, it helped maintain the skin barrier, did not cause skin redness, and improved hydration in some people. Another abstract concluded that a sunflower oleodistillate improved skin barrier function and relieved atopic dermatitis. Low birth weight infants treated with sunflower oil are 41% less likely to develop a nosocomial infection (an infection occurring in a hospital or health care facility), according to a Bangladesh study. The oil is also used to treat bruises and psoriasis. If you strive to live a healthy lifestyle, adding sunflower oil to your diet is an excellent choice. Its nutrition content supports a healthy body inside and out. Its light taste and high smoke point make it ideal for vegetarian cooking and it lends itself well to salad dressings and sauces, roasted vegetables, stir-frys or fried vegetable tempuras. Before using sunflower oil as a way of treating or preventing any illness or skin condition, please consult your doctor.